The Guardian has a story about Gifting at Burning Man, and what it all means. What happens to groups of people in harsh physical environments, away from all of the trappings of modern civilization? Tales of shipwrecks, adventurers and post-apocalyptic worlds explore this question, and usually these stories do not end well (recall the descent into anarchy and violence in Lord of the Flies). The political philosopher Thomas Hobbes warned that outside of civilized society, humans are nasty brutes who would sooner step on another’s face than share scarce resources. Burning Man is a massive weeklong public arts festival held every August in Black Rock City, Nevada. You might imagine this event, where 65,000 people converge in a blazing desert devoid of water, food or electricity, would be a recipe for disaster. But what happens at Burning Man might surprise even the cynics. Somehow this environment brings out the very best aspects of human nature. There, kindness flourishes and generosity is widespread. How does this happen? Research on the psychology of human altruism offers some clues. …Subtracting money from social interactions could be a key contributor to the spirit of generosity that permeates the atmosphere. An influential set of studies showed that even just thinking about money makes people less likely to help others and less interested in spending time with others. Subsequent research found that university students were more likely to cheat after seeing 7000 dollar bills than after seeing only 24. It seems that being around money brings out the worst in us. So what exactly is it about money that dampens our taste for generosity? One possibility is that when we participate in financial transactions, we follow different social rules than when we share our resources communally. Drawing from anthropology research, scientists James Heyman and Dan Ariely proposed that there are two types of human transactions. In monetary markets, people pay money for goods and services: imagine you own a restaurant, and your customers pay you for their meals. Meanwhile, in social markets people help and share with one another out of kindness: imagine inviting a close friend to your house for dinner. Because these two different markets exist, people will sometimes paradoxically expend more effort for no payment at all (in a social market) than for a small payment (in a monetary market). For example, you might agree to help a friend move house as a personal favour, but if he offered to pay you £1 for your services, you would be insulted and refuse. Since nothing is for sale at Burning Man, this means virtually all human interactions take place in social markets, where sharing and caring rule the day. 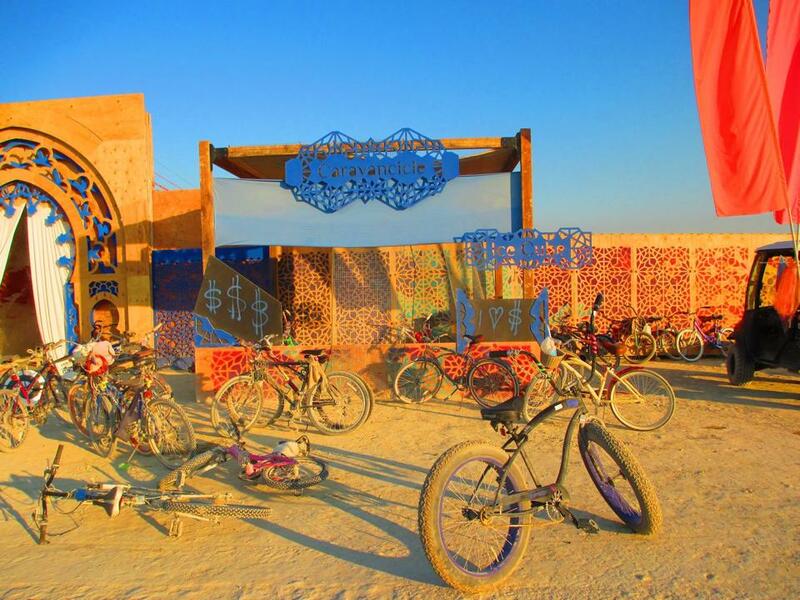 The culture of generosity that defines Burning Man doesn’t simply appear out of thin air. Participants are urged to follow the Ten Principles, a code of conduct that includes gifting, communal effort, and civic responsibility. These guidelines are published front and center in the festival programme, re-iterated in public service announcements on the festival radio station, and often pop up in conversations in the city. They are impossible to ignore. These public declarations of the prevailing social norms likely play a central role in spurring the widespread cooperation in Black Rock City. Countless studies have shown that humans are not blind altruists, cooperating regardless of what others do, but rather are conditional cooperators: we prefer to cooperate only when we are reasonably certain that others will too. So telling people that their peers are cooperating is one of the best ways to get people to cooperate themselves. For example, hotel guests are more likely to re-use their towels if they learn that previous guests re-used their towels – even more so than if they are told that re-using towels helps the environment. In Black Rock City, the highly visible constant stream of gift-giving not only reassures you that others are cooperating, but also motivates you to pay these favours forward. This is formally known as generalized reciprocity,and researchers have shown that paying generosity forward is most likely to evolve when communities are interdependent and contain smallsubgroups. So the social structure of Burning Man, where everyone must work together to stay safe in the harsh desert and ‘leave no trace’ environmentally, and where people are organized into small camps, provides the optimal conditions for generalized reciprocity to take hold. Many studies have shown a link between positive mood and generosity. When we are happy we are more likely to help others. Herein lies another explanation for the prevalence of altruism at Burning Man. The general mood there is positively giddy. You might think this is merely a side effect of euphoric drugs, but in fact at any given time most people at Burning Man are not high on drugs. [REALLY? WHERE DID THEY GET THAT INFORMATION? – Ed.] Their high is entirely natural, and recent research can help explain why. A study led by neuroscientist Robb Rutledge showed that feeling happy depends not on how well things are going in general, but instead whether things are going better than expected. In other words, pleasant surprises have a big effect on happiness – and these abound in Black Rock City. Hardly a minute goes by without some sort of weird and wonderful episode, like spotting a giant mobile octopus spouting flames from its tentacles, or encountering a man offering you a giant platter of delicious grilled steak, or stumbling into a glass dome rigged with colourful LED lights that give you the sensation of being inside a rainbow. It’s no surprise, then, that this environment puts people in a good mood, which then boosts kindness and generosity. And it turns out the causal arrows also run in the reverse direction. Work by Elizabeth Dunn, Lara Aknin and Michael Norton has shown that being kind to others promotes happiness. So happiness increases helping, and likewise helping increases happiness, creating a positive feedback loop of warm fuzzy feelings (and their associated neurochemicals) in oneself and in others. And these natural neurochemicals could well be habit forming. Census data show that 60 percent of this year’s visitors were repeat customers. Scientists have been studying altruism in the lab since at least the 1950s. This work has identified many factors that promote or reduce altruism. But these studies can’t tell us everything, in large part because they use highly simplified models of altruism. For example, one popular research tool is the dictator game, where one volunteer receives some money from the experimenter – say, £10 – and then must decide whether to share any of this windfall with another volunteer. Lab studies using the dictator game consistently show that people are willing to share some of the money, but a recent study observed almost no sharing whatsoever when they had people unwittingly play a real-world version of the game at a bus stop in Las Vegas. Some social scientists question whether altruism in the lab accurately reflects altruism in the real world. Burning Man is of course radically different from the real world. Nevertheless, it’s encouraging that a lot of what we know about altruism from lab studies does seem to generalize to human behaviour in the wild. If social scientists were to build a new society designed to promote cooperation, based on evidence from lab studies, it would probably look a lot like Black Rock City. Indeed there is a growing research community whose members have been studying Burning Man for years. The question that remains for scientists and laypeople alike is how we can translate these lessons – both from the lab and Black Rock City – back to the world we all inhabit the other 51 weeks of the year. See original story and images at The Guardian.